Just in time for the Superbowl, this super easy appetizer is not only delicious, but a crowd pleaser too! The idea came from a local restaurant that serves something similar as an appetizer, however they make their own potato chips instead of using waffle fries. That’s definitely an option for the ambitious cook who wants to mess with a deep fryer on Superbowl Sunday. Enjoy! Meanwhile, cook bacon. Let cool slightly and crumble. Dice vegetables, toss together and set aside. Mix blue cheese with milk and microwave for 1 minute or until warm. Stir add more milk if needed should be a slurry consistency but not too runny–you still should have some chunks. 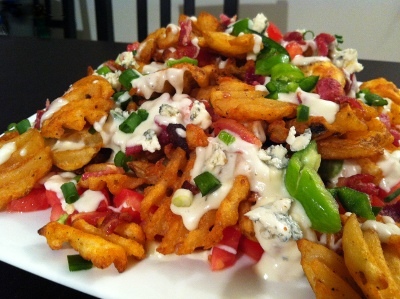 For assembly, put french fries on plate first, top with bacon crumbles, vegetable mixture and finally pour on blue cheese sauce. The numerous Canadians tuning in the Super Bowl on Sunday event will be more desperate to absorb the luxurious television ads as compared to the nfl football sport in itself, a brand new survey implies. That doesn’t signify, however, that probable ad-watchers will likely be turning on their tv screens to do so. Of people who hope to check out the big-budget advertisements that have turn into a hallmark of the event, the review found over 45 per cent wish to view them on the net rather than at the time of the matchup between the Denver Broncos and Seattle Seahawks.